Ideally i would keep them all but to be realistic i need to look for homes for some of them! I have been meaning to part with this one since the day he was born but have never found the ideal home for him. He needs someone who understand him as he has been trained Parelli style and is fantastic at that but so few people can ride effectively that way and he will get confused in the wrong hands, never was the brightest spark). Having said that strangely enough i have tried total novices on him and under my instructions they have been able to get him to do everything they have asked. Nice friendly (verging on soppy) horse very responsive ride sensible but not suited to total novice as will obey the slightest aid even if you don't mean it. Has never done more than a bit of hacking out and some Parelli exercises in the field, very low mileage, feet like iron, I don't shoe him, and easy to catch, trim etc. A perfect gent in the stable. Far too big for my needs but I will only let him go to the right home. Been in a wagon a couple of times but never to shows etc, could be doing so much more than he does here. 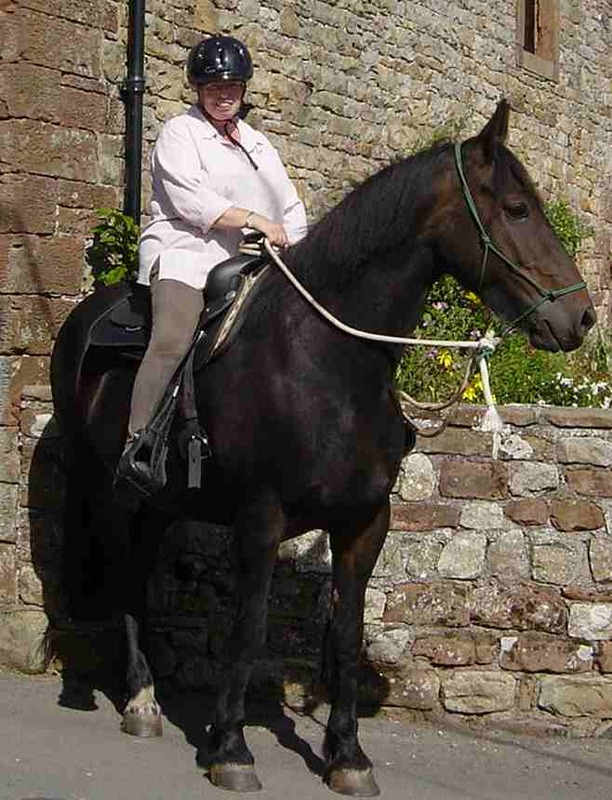 Presently used for pleasure riding and also available for loan to stay here. 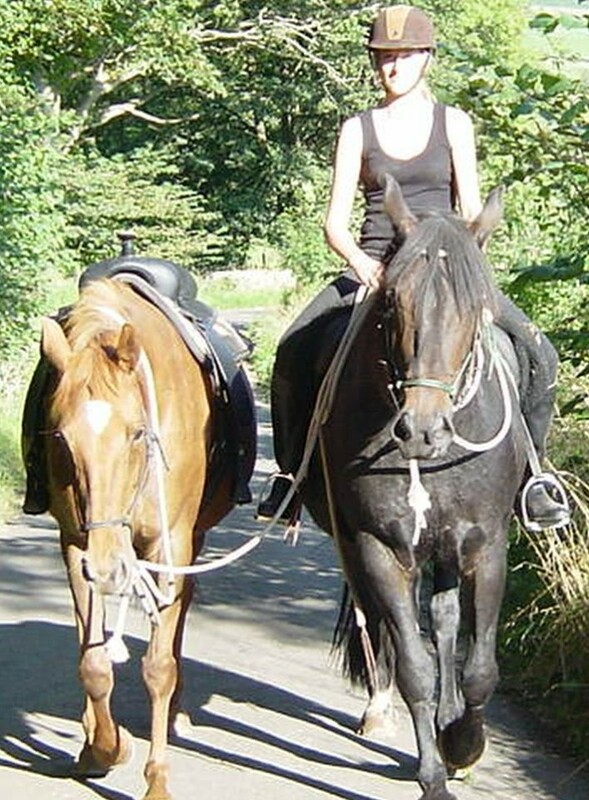 I Would love to sell Mulberry and the lovely chestnut mare, Ellerbeck Brazil as a pair as they are such good friends and if that could be done the cost would be for the pair. See his own page of course. He is so friendly as are all this year's babies and is growing strong and smart, will make a great family cob, for riding and driving. Mail for recent photos this was at five days old, he should make about 14.2 to 15hh easily. Ellerbeck Gunsmoke (May 2007) small chunky gelding, dark grey (blue roan) out of 12hh spotted mare by small Fell pony, Stands at around 12.2hh now so could make around 13hh I guess. Very sweet, calm temperament and we plan to yoke him. Given half a chance he would be in the house with us. Will make a lovely child's pony. Now lightly backed and looking for the perfect jockey. This is a fabulous red and white yearling, quiet logical temperament and responsive willing learner, I am in no hurry to part with him at all. He has excellent bone, a pretty head and will look fabulous when fully furnished with all his feather and mane and tail grown. should make 14.2hh plus as he seems taller than previous foals from this breeding. update 2011 about to start him, Looking good and still available and boy is he athletic, cleared a five barred gate from a standstill the other day. Out of Ellerbeck Gala and by John Wilf. Homogygous black and white filly, very strong with a sweet temperament could make 15hh. She has the quietest most sensible attitude and is very easy to deal with, looks like she will feather up and furnish nicely. It won't break my heart to keep this one but if anyone wants a real laid back friendly filly who has obviously been here before then get in touch. Her full sister, Banquet, is now in America where she is thrilling her owner. I was thinking of keeping this one to breed from but as i am now wanting to breed dilute colours, she may not fit into my plans so she could be sold. Gorgeous chunky mare, not sure I want to part with her but available to the right home.